II. Torsors, motives and cohomological invariants aligned with the main themes of the program. Each period will feature several mini-courses and lecture series aimed at young researchers and students. At the end of each period we plan to have a mini-workshop with more specialized talks. We plan to organize two seminar series, one more traditional with invited speakers (established researchers and postdocs) and a second one in the form of learning seminars aimed at graduate students and young researchers. 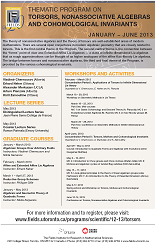 At the end of the program (June 9-15, 2013) we plan to have a conference summarizing the activity of the semester. Summarizing the activity of the semester. May 21-23, 2013 at 3:30 p.m.
May 28-30, 2013 at 3:30 p.m. Seminars are important occasions for participants and short-term visitors to meet and exchange ideas. There will be two types of seminars, a more traditional seminar for established researchers and a second one for young researchers and participating students. The second seminar will be rather informal. Its aim is to provide young researchers a forum to discuss their ongoing research, or to learn together some more advanced topics. All scientific events are open to the mathematical sciences community. Additional support may be available to support junior US visitors to this program. Fields scientific programs are devoted to research in the mathematical sciences, and enhanced graduate and post-doctoral training opportunities. Part of the mandate of the Institute is to broaden and enlarge the community, and to encourage the participation of women and members of visible minority groups in our scientific programs.